In less than one month, a rebuild automated press operations to increase production rates and improve quality. Southern Manufacturing Group (SMG) located in Morrison, Tennessee, was founded in 1993. The company makes automotive components and industrial valves. 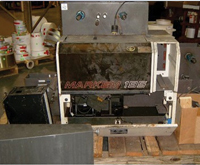 In the fall of 2012, the automation system for its 175-ton hydraulic forming press received electrical damage resulting from a lightning strike (Figure 1). Purchasing a new hydraulic forming press would have been prohibitively expensive, in the range of hundreds of thousands of dollars. Therefore, SMG needed a company that could repair the forming press in a minimal time-frame to maintain its production schedule. Required repairs mandated either replacement of components on the existing antiquated automation system, or a completely new automation system. The decision to repair or replace would be driven by multiple considerations including cost, schedule, and functionality of the old versus the new automation system. Although the press is 40 years old, it’s still a very robust machine that was definitely worth repairing. A dual-action press, it shapes two separate parts in different ways at the same time. During the first step the hydraulic forming press bends the metal in half without creasing it; in the second step it rounds the metal piece. After the first step the metal piece moves to the second step, and a new piece is inserted in the machine for bending. This continuous process significantly increases production yield as compared to simpler machines that only shape one part at a time, but it also requires more than a simple automation system, as multiple operations need to be controlled simultaneously to close tolerances. In order to get the hydraulic forming press working again, SMG turned to fully licensed electrical and mechanical contractor, American Construction Technologies (ACT), in Nashville, Tennessee, to find an economical and timely solution. When ACT inspected the press, its engineers were faced with multiple challenges, including the repair or replacement of the automation system. At this point ACT called KCC Software in Huntsville, Alabama, for an automation solution that would not only work with the existing machine, but also improve it. Our longtime business partner ACT called us because we specialize in software programming and technology integration for manufacturing customers. While ACT would build the new automation system enclosure and perform all wiring, as well as improving and updating parts of the hydraulic system, we would take on the challenge of quickly creating a new, modern automation system. Even presses designed 10 years ago often don’t have the automated features and functionalities that help manufacturers decrease cycle times and improve production consistency. For example, the old automation system couldn’t automate press runs, so operators needed to manually enter instructions with each job setup. Not only did this add to cycle times, it also significantly increased the possibility of error and inconsistent part runs. The old automation system also lacked modern features and functions, and was becoming difficult to support. For these and other reasons, SMG was willing to consider replacement rather than repair of the old automation system, provided the replacement system could be designed and installed quickly, and for a reasonable cost. Preliminary investigations were sufficient to allow us to satisfy SMG’s requirements, so we began the next step of new automation system design. KCC Software began design of the automation system by considering the system requirements – pressure transducer feedback, encoder feedback, fast response times, accurate and timely valve controls – indicating that a very flexible controller was needed. We’ve been a long-time satisfied user of AutomationDirect products, so we selected their Do-more series PLC CPU module along with a high-speed counter module to interface to the encoder on the press. The other I/O cards selected for the PLC were standard DirectLOGIC 205-series cards for the discrete inputs and the relay outputs required by the press, along with an analog input card for pressure transducer feedback. There were many reasons why we selected the Do-more PLC for the automation system retrofit, besides previous positive experiences with AutomationDirect. The PLC is extremely fast and very easy to program, yet very affordable. This PLC offers programs and tasks, essential to a well-designed automation system controller program, particularly for this application. Not all PLCs provide these controllable program segments, especially not the less expensive and more compact models. These features enabled us to separate the code into manageable pieces; its programs and tasks can also be employed multiple times inside a program, as well as used to develop new programs. A key step was programming the force of the hydraulic press to match the preset movements of the machine. The correct pressure together with the corresponding ram travel plus other key parameters were stored in the new controller’s memory by job number, and were configured to be automatically preset by the die setter. For deep drawing operations, the blank holder or hydraulic die cushion force was programmed to be varied through the press cycle, improving operations and reducing machine wear. The high-speed counter interface module helped us design, program and verify the encoder interface in just over an hour. Ironically, this was the part of the automation system design that concerned us the most, yet it turned out to be the easiest as the wiring and data connection were very simple, and the programming required very little math due to the built-in functionality of the module, plus its seamless integration to the PLC’s CPU module. We chose the AutomationDirect 15-inch C-more touch screen for the system HMI. This panel offers large, easy-to-read screens with password-protected access to maintenance screens and documentation, along with other features not available on the older automation systems. Adding a powerful PLC and HMI panel to the 175-ton hydraulic forming press gave the operators the ability to perform touchscreen commands to automatically control the press, eliminating the need for manual adjustments (Figure 2). In addition, the new automation system stores multiple programs or recipes, improving both cycle times and positional accuracies. Prior to the rebuild, operators had to manually enter the program parameters for each new job. Now, the press operator simply selects the desired recipe, which contains values that have been checked through qualifying runoffs (Figure 3). Another key feature of the system is statistical analysis of the press’ performance. This enables SMG machine owners to detect potential hydraulic issues early on, and also ensures that the machine operates within established parameters. SMG also created additional quality checks to ensure the machine was running according to its specifications. The automation system now measures the depth of the press as it presses on a part. Operators now know the depth of a motion to 1/100th of an inch on a 6 to 7 inch stroke length. This helps them predict when the die needs sharpening, or when the hydraulics need repair. The reversal of the press is a critical production process as it prevents parts from falling out of tolerance. Prior to the rebuild, the old automation system required a manual proximity switch to signal positioning on reversal. Unfortunately, the manual switch accuracy was dependent on the steadiness of the operator’s hand. The new PLC-based automation system has automated the reversal of direction step, which is now based on measured pressure. This has made the depth of the press motion extremely consistent, ensuring part uniformity and extending the life of the machine. As efficiency increases due to automation and improved operation, wear on the oil and hydraulic components is reduced. If the press depth starts to change, it’s usually an indication of a hydraulic leak or a problem with the die that helps form the part. By being able to address these issues before the machine goes out of tolerance, SMG can keep operating without unscheduled downtime. Communication and cooperation among SMG, ACT, and KCC Software was critical to project speed and success, particularly as the schedule was very compressed to avoid downtime. The automation system retrofit began in late October 2012, and the replacement automation system was installed and operational before the end of November 2012. The PLC programming software includes a simulation feature, allowing users to program simulated versions of machine operation. Programming these simulated operations, and testing them against the PLC code, eliminated the need for I/O hardware during testing, which facilitated rapid prototyping and development. This capability also enabled the concurrent engineering with ACT that was essential to meeting the rapid schedule demanded by the project. By using the PLC base and modules, we were able to guide ACT in the integration and wiring of the control panel based on existing drawings and knowledge. Although the Do-More is a newer PLC, it leverages existing, familiar components and modules to make integration and documentation easier and quicker for those who have prior experience with AutomationDirect’s legacy PLCs. Since installation, the press has run flawlessly. SMG is very pleased with the performance of the new automation system. Particularly appreciated are the recipe functionality, access to the performance data, and the ease of setup and maintenance when changing dies or performing routine preventative maintenance. The press now only requires semi-attended operation to achieve exact positioning, which is critical to both operator safety and product quality. The maximum press depth is extremely consistent, and the automation system’s setup screens enable users to tailor desired performance to exacting standards. SMG was also very pleased that the final cost that was approximately 50 percent less than an earlier quote to simply replace the controller boards, confirming our original estimates. By using high-quality yet affordable automation system components, we were able to keep expenditures down, while still delivering a dramatically improved automation system in less than a month. New C-more EA9 Series HMI FAQs – Issue 29, 2014 →← Do-more Designer Gets More Amazing!